A striking thing to me, which struck when I went to look up his career stats, was the realization that this is Albert Pujols’s seventh season in Anaheim. That is a long, long time in baseball terms, an entire second career that started at age 32. It’s surprisingly tough to recall his Cardinals heyday in anything but academic, statistical terms—how it felt, basically, to coexist with the best hitter on the planet. If you’re college-aged right now, you probably can’t even really remember it. I promise you that it was something incredible, even (especially) during the heart of baseball’s steroid dramas. Pujols was as much a slugger as anyone, but he was a contact hitter too, graceful rather than lumbering; certainly more Griffey than McGwire, say. A thing I like to do occasionally, despite knowing how nerdy it is, is to just look at his stats. Some of those years—the 2008 MVP season, and especially his 2003—are unreal, feel unreal, and I watched them! I am trying to imagine how they look now to someone too young to have paid attention, and I was ready to throw up my hands and write that there’s really no analogue to explain what it was like when Albert Pujols was in his bloom, the hype, the hyberbole, the knowledge that all of that was justified. But no, it’s not impossible to convey. The differences are a matter of degree and not of kind: It felt kind of like how it feels to have Mike Trout around. In 2012, Pujols signed a 10-year, $254 million deal that would run through his age-41 season. Everyone knew that by the end of it it would be a total mess. Presumably even the Angels knew that, weren’t totally bewitched by the chemically driven second primes of aging sluggers over the previous decade but understood that was just the cost of signing a player like Pujols—there haven’t been many players like Pujols—at that stage of his career. (The Marlins reportedly offered around the same amount of money, and that’s a fun alternate universe to imagine.) And yes, Pujols fell off, as human bodies tend to do; his OPS in his worst Cardinals season remains better than that of his best Angels season. But even now, at age 38, in his seventh season here with the Angels, Pujols hasn’t been a disaster. Not great enough to justify the salary, of course, but far from a disaster. It has been an exceedingly normal, perfectly respectable downslope of a career arc after an aphelion that would have justified Cooperstown if he had quit then and there. 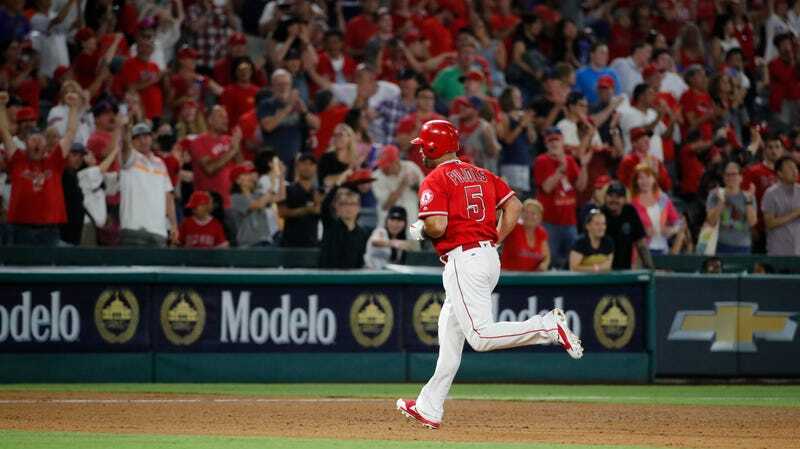 Even this season is fine enough: Through 86 games, Pujols is hitting .251 with 16 home runs and 52 RBI. If that feels like it’s bad, that’s only because he’s him. There certainly aren’t very many other 38-year-olds putting up numbers like that. If there’s a sadness to this beyond the existential sadness that comes with contemplating mortality, it’s that Pujols is toiling out the last few years of his career in relative obscurity, racking up Fine Season after Fine Season ingames played after most of the country has gone to bed, on a team that hasn’t won a playoff game since he’s arrived. Perhaps that’s a selfish sadness on my part, because Pujols himself seems happy enough, and to whatever extent his relationship with the similarly fame-benighted Mike Trout includes being a mentor, that’s obviously going well. And there’s also the silver lining of having to follow Pujols’s career in fits, not from daily viewing but from the occasional check on his numbers to see how he’s doing. Having to look him up on Baseball Reference means getting to look him up on Baseball Reference. Which means getting to soak up everything he’s done, over and over again. It’s a career that won’t let you forget it. Last night, Albert Pujols homered twice, the 629th and 630th of his career, to tie Ken Griffey Jr. for sixth on the all-time home run list. He could realistically catch Willie Mays by the end of next year, and then Alex Rodriguez the year after that—or perhaps he has to wait until the following season, his final one under contract, to run down A-Rod and then Babe Ruth. “Greatness” is harder to put a name on than “history,” harder to taxonomize, harder to recognize in the moment. But it was those hallucinatory St. Louis numbers that made it so we can now put Albert Pujols’s name in the same sentences as the legends. Over the course of a career, you might say, greatness facilitates history. We can appreciate them both.